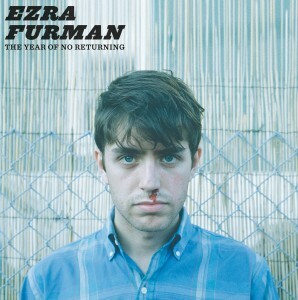 ALBUM REVIEW: Ezra Furman, "The Year Of No Returning"
This Chicago native makes his solo debut on Bar/None with The Year Of No Returning; a fine effort that immediately made me smile. This is a darkly funny album, intended or not. The lyrics are wry and biting and the structure of the songs tend to offset the themes to successful effect. If I may make a comparison, Furman delivers these songs as a cross between a pissed-off Freedy Johnston or a charmingly funny Alex Chilton. But make no mistake – the bile is there; it’s just masked in melody. “Dr. Jekyll & Mr. Hyde” opens the album with an angry, strident strumming acoustic guitar and subtle sleigh bells for percussion; “American Soul” has some of the best, twistedly humorous lyrics I’ve heard in a while (“I’m a Jew through and through and now I’m about to write you a bible…”). “Sinking Slow” is a disconnected but effectively lush ballad with piano and strings that suddenly snaps into a Beach Boys-like refrain; “That’s When It Hit Me”, the album’s standout made me think of a bluesier Replacements and “Cruel, Cruel World” is downbeat but neat acoustic pop. If you’re going through a break-up, this is the perfect soundtrack. Full marks to Ezra Furman for this.